After Hurricane Harvey ravaged Houston, the shutdown of Gulf Coast refineries strained fuel supplies in much of the United States, including Florida, which gets almost all of its oil by boat. As Hurricane Irma menaced the Caribbean, increased demand within Florida drove up gas prices even further. There and in Puerto Rico and the U.S. Virgin Islands, emergency responders also needed fuel for rescue and recovery efforts. So to more quickly get fuel to hurricane-hit regions, the Department of Homeland Security on Friday temporarily suspended an obscure, nearly century-old law called the Merchant Marine Act, better known as the Jones Act. "We are worried about the fuel shortages," White House Homeland Security adviser Tom Bossert said at the White House on Friday. "We are bringing in as much supply of refined fuel as possible, and we've waived a particular statute that allows for foreign-flagged vessels to help in that effort." By issuing a temporary stay of the Jones Act, long a bugaboo of proponents of free trade, President Trump has set off a new round of calls for reforming the law — or outright repealing it. Passed in 1920, the Jones Act requires that all ships transporting goods between U.S. ports be owned and manned by U.S. citizens, and be built within U.S. shores. Sponsored by then-Sen. Wesley Jones (R-Wash.) as a boon to shipbuilders and longshoremen in the port of Seattle, the law is lambasted today by free-trade proponents who regard it as a relic of the country's protectionist past. Defenders of the law -- which include unions and some national-security experts -- say the Jones Act protects U.S. jobs and ensures the nation has the shipyards to build naval fleets if necessary. The debate over the arcane law also stresses the tendons holding together the two halves of Trump's political thinking. With his “energy dominance” agenda of encouraging more fossil-fuel extraction in the United States, Trump has identified himself as an ally of the oil and gas industry, which wants to rein in the shipping law that it argues raises domestic fuel prices. But Trump also regards himself as a proponent of blue-collar workers, such as those working in shipyards, who helped vote him into power. Most presidential candidates take a position on the Jones Act while running, according to James Coleman, an energy law professor at Southern Methodist University. But Trump's position on the little-known statute was never clear. “So no one really knows what the Trump administration thinks,” Coleman said. Tension has flared before surrounding the Jones Act during times of crisis. President George W. Bush temporarily waived it following Hurricane Katrina, which also shut down Gulf Coast refineries. But Obama declined to do so during the Deepwater Horizon oil spill to the consternation at the time of the Heritage Foundation. Shortly before Trump issued the waiver prior to Irma's Florida landfall, the Heritage Foundation's Salim Furth used the need for disaster relief to again critique the law: "For Trump, this is an opportunity to drain a corner of the swamp that profits from the misfortunes of Americans." The Trump administration faced an early test when it had to consider whether to continue a review of the Jones Act's exact scope, which was initiated during the last days of President Obama’s tenure. The review aimed to close loopholes formed during the almost-100-year-old history of the law. Starting in 1976, rulings began allowing foreign-flagged ships to deliver energy-industry equipment to offshore oil platforms. The American Petroleum Institute, the largest oil and gas lobbying group in the country, opposed undoing those rulings, arguing that by making it harder to get equipment to offshore drilling operations, the changes “would have widespread negative impacts on American jobs and the national economy,” API’s Erik Milito said in April. Trump’s decision in that instance: Side with the oil and gas industry, and scuttle the Obama-initiated review. But even Jones Act opponents think it will be harder to get much further than that. In 2015, Sen. John McCain (R-Ariz.) introduced an amendment repealing the Jones Act. "From time to time in Congress we find that legislation still remains on the books many decades after it has served its original stated purpose," McCain said in 2015. But McCain's effort gained little traction. And two years later, some Republicans and Democrats have a different view on what it means to be a free-trade proponent with Trump in office. -- Say that again? After not being asked a question about climate change during a White House news conference since at least Aug. 23, a Trump administration representative finally address the issue on Monday amid the busy hurricane season. At first glance, the answer, from President Trump’s homeland security adviser Tom Bossert, is less than clarifying. But in fact, it actually is. "I will tell you that we continue to take seriously the climate change, not the cause of it, but the things that we observe," he then said. "Gaffe" is an overused word in U.S. politics, thrown around anytime a political figure blunders. But according to journalist Michael Kinsley, founding editor of Slate, gaffe has a specific meaning. "A gaffe is when a politician tells the truth," Kinsley once said, "some obvious truth he isn't supposed to say." That seems to be what Bossert did here: Acknowledge that the administration is ignoring the underlying causes of climate change while also trying to address, in the aftermath of two intense hurricanes, its potential causes. -- All that said, there was some substance to come from Bossert's news conference. Namely, that the administration is preparing to ask for even more hurricane relief funding from Congress — a "third, perhaps fourth supplemental for the purpose of rebuilding," Bossert said. "We will do it smartly." -- Head in the clouds: President Trump’s nomination for NASA administrator, Jim Bridenstine, has gained some support in Congress, reports The Post’s Christian Davenport, despite some of the controversy surrounding his credentials and his position on climate change. Bridenstine, a 42-year-old conservative would be the first politician to run NASA, a point of criticism from Florida Sens. Marco Rubio (R) and Bill Nelson (D). But Rep. Ed Perlmutter (D-Colo.), a colleague of Bridenstine’s on the House Science, Space and Technology Committee, called him a "a no-nonsense, straight shooter when it comes to space exploration and weather issues." Perlmutter added he would defend Bridenstine in front of senators. Meanwhile, more scrutiny is being given to Bridenstine's effort to rewrite the underlying missions of NASA itself. While in Congress, Bridenstine has introduced a bill suggesting that NASA lacks a “clear purpose or mission" and that it "should undergo reorganization, altering its mission with a clearer focus." Bridenstine wants to de-prioritize science at NASA and instead focus the agency on space travel. But as Will Thomas, science policy analyst at the American Institute of Physics, pointed out, science has been part of NASA's mission since Day One. In fact, "expansion of human knowledge of the Earth and of phenomena in the atmosphere and space” is the very first objective of NASA listed in the 1958 National Aeronautics and Space Act, the legislation that created the space agency. -- "When you don't want to see, you don't see": Pope Francis condemned climate change deniers on Monday, charging that, in the wake of two back-to-back massive hurricanes in the United States, “history will judge the decisions” of those who deny scientific consensus on the issue. Francis warned: "If we don't go back we will go down… You can see the effects of climate change with your own eyes and scientists tell us clearly the way forward. All of us have a responsibility. All of us. Some small, some big. A moral responsibility, to accept opinions, or make decisions. I think it is not something to joke about." He cited a passage from Psalms about the stubbornness of man, the New York Times reported, in response to political leaders' skepticism of climate change. -- "If this isn’t climate change, I don’t know what is": Miami’s Republican mayor even more directly challenged the administration on climate change — in particular, Environmental Protection Agency chief Scott Pruitt. Last week, Pruitt said “to use time and effort to address it at this point is very, very insensitive to this people in Florida." 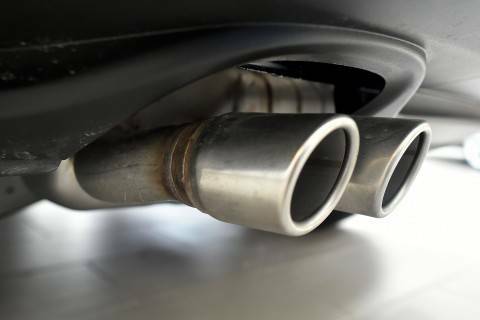 New York, California and three other U.S. states said on Monday they sued the federal government for delaying the rollout of higher "gas-guzzler" penalties for automakers whose vehicles fail to meet minimum fuel-economy standards. Millions could remain in the dark for days and weeks. Yet they add: "in the face of cataclysmic warnings and worries — including a mass exodus from Florida’s most-populous area — Irma largely spared many of the major cities predicted to be in its path. 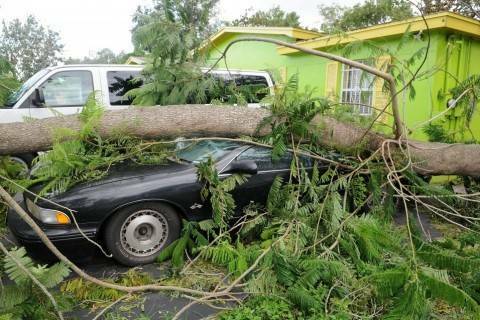 Some, including Tampa and Orlando, escaped relatively unscathed. Others, such as Jacksonville, experienced unlikely — and record-breaking — effects." 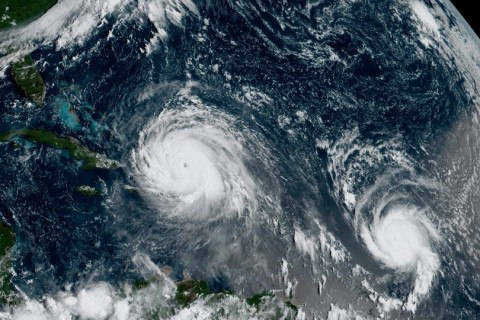 Why wasn't Irma's impact as bad as predicted? The Post's Jason Samenow writes that "several twists of fortune eased the pain the storm inflicted on the state. And only slight deviations would have made the storm’s outcome much more severe." 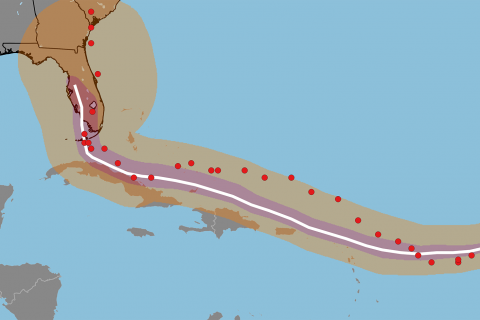 The center of Irma scraped along Cuba’s north coast, which was bad for Cuba but good for Florida because the hurricane dropped from Category 5 to Category 3 once it began to interact with a land mass. The most intense right-front quadrant of Irma's eyewall passed to the east of populated Key West, instead blasting the Florida Keys’ far less developed zone from Sugarloaf Key to Marathon. Later, that dangerous right-front quadrant with the worst winds and biggest surge targeted the stretch from Everglades City to Marco Island, instead of the heavy population center of Miami. Finally, that landfall made Irma weak enough to spare the very vulnerable Tampa Bay area and other populous sections of the state from the worst damage. White House homeland security adviser Bossert said it would likely be weeks before residents will be able to return to the Florida Keys. Tens of thousands of children returned to school on Monday in the Houston area after one of the nation’s largest school districts was shutdown during Harvey. The EPA said it will allow Florida’s power plants to operate without being required to meet pollution control regulations in order to continue delivering power across the state in the aftermath of Irma, Reuters reported. Some of the remaining floodwater in Houston is contaminated with dangerous levels of bacteria and toxins in the aftermath of Harvey, the New York Times reported, based on testing organized by the newspaper. -- Photo finish: NASA images of the U.S. Virgin Islands in the aftermath of Irma’s destructive path shows the islands going from a verdant green to brown. It's not just about winds, or rain, or higher seas. Hurricane forecasts can be better. The House Natural Resources Subcommittee on Federal Lands holds a legislative hearing on the SHARE Act. The Atlantic Council holds a hearing on the geopolitics of natural gas. The House Natural Resources Committee holds a markup on various legislation.